Krill are shrimp-like crustaceans that occupy a relatively low position on the food chain, feeding on plankton and ice algae. RegenaLife's Deep Ocean Krill Oil is harvested from THE WORLD'S CLEANEST & PUREST WATERS. Our krill oil is independently tested to ensure it's free from harmful contaminants. RegenaLife's krill oil contains naturally occurring long-chain omega 3 fatty acids; EPA (eicosapentaenoic acid) and DHA (docosahexaenoic acid). These phospholipids are superior to the triglycerides found in fish oils, being easily absorbed. This reduces the fermentation and burping problems commonly associated with fish oil supplementation. Antarctic krill is rich in the antioxidant astaxanthin, which gives the oil its characteristic red color. Astaxanthin is a natural carotenoid-type of antioxidant that is even more powerful than beta-carotene, alpha-tocopherol, lycopene and lutein. Astaxanthin naturally quenches free radicals, keeping the product fresh. Thus, no additives are necessary to maintain krill's long-term stability. By comparison, antioxidants are added to most dietary supplement fish oils to prevent them from going rancid during production or on the shelf. Krill Oil Protects for the brain, eyes and central nervous system. Natural mood support. Krill is Important for memory, concentration and learning. Krill Oil is a natural anti-oxidant protection against sunburn. Krill Oil has Anti-aging properties & Immune system support. 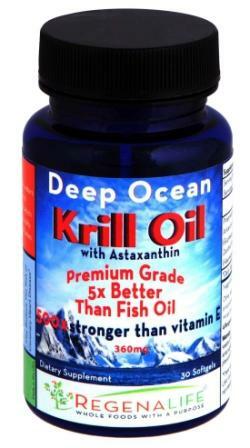 Krill Oil Promotes heart health. Krill Oil May protect against Stomach Ulcers & Chronic Gastritis because it fights bacteria in the gut that cause these problems through its potent carotenoid content. Our krill oil is derived from the most sustainable source on the market. Krill are the largest biomass on earth. Yearly harvests are a mere few percent per year, meaning that production can continue sustainably for centuries. The harvesting of krill for the RegenaLife label is regulated by various organizations, such as World Wildlife Fund Norway. In addition, eco-harvesting effectively prevents the accidental bi-catch of birds, fish and other marine mammals. Krill harvested via traditional methods undergoes rapid decomposition. 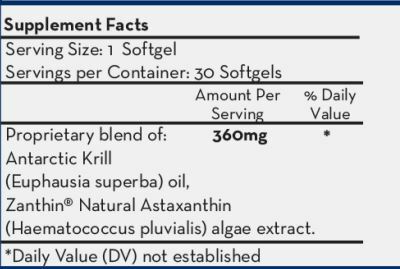 Krill Oil Warning: If you are allergic to shellfish, have a blood coagulation disorder, or are taking anti-coagulants, do not supplement with krill oil. Also, do not store krill oil in the refrigerator, which can reduce its effectiveness by breaking down the phospholipids over time.